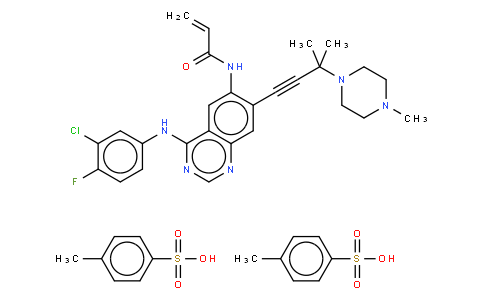 AV-412, also known as MP-412, is a second-generation, orally bioavailable dual kinase inhibitor with potential antineoplastic activity. EGFR/HER2 inhibitor AV-412 binds to and inhibits the epidermal growth factor receptor (EGFR) and the human epidermal growth factor receptor 2 (HER2), which may result in the inhibition of tumor growth and angiogenesis, and tumor regression in EGFR/HER2-expressing tumors. This agent may be active against EGFR/HER2-expressing tumor cells that are resistant to first-generation kinase inhibitors. EGFR and HER2 are receptor tyrosine kinases that play major roles in tumor cell proliferation and tumor vascularization.